Just last week I was writing about the importance of sometimes ignoring Wall Street analysts whose focus on quarterly earnings can force a company into neglecting its best interests. Bowing to the demands of quarterly reporting (and profits) reflects short-term thinking that might prevent long-term success. Today Dell decided to go private in a $24 billion dollar deal that involved about $15 billion in debt, private equity and an assist from Microsoft and I think it reflects Dell’s need to step away from that thinking. It’s a gutsy move but one that I think will benefit Dell. It is also somewhat like a restructuring under court supervision during a bankruptcy but this has none of the stigma of a bankruptcy nor does it have the outsiders looking over your shoulder that can make such a restructuring so difficult. Dell will be free to chart its course though it must be said that its partners in this endeavor can’t be expected to be silent. But neither can they be expected to be naïve about what’s ahead, they presumably are smart people who went into this with open eyes. So, what are they doing and why? Well, PC and laptop sales have peaked. The industry will sell a lot of boxes this year, but the growth is out of the market and it is becoming a zero-sum situation of replacements and takeaways. In Q4 2012 the majors, including Dell, shipped a combined 90,372,942 units — 4.9% less than in 2011’s Q4 according to Gartner. At the same time, smaller devices are ramping like crazy — headline: “Gartner: PC sales continue to slide as tablets eat their lunch” and as the PC makers sneeze, Intel, the maker of the CPU chip, catches cold — headline — “Intel profit sinks 27% on dreadful PC sales”. So the play now is to compete in tablets and smart phones and try to make it up on volume and software. But the prices are lower for smaller devices and so are the profits. When Dell was a public entity, no Wall Streeters wanted to know about declining sales of big boxes or rising sales, but lower margins, of devices. But that’s the reality. As a private company Dell will be freer to attack the device market and to more aggressively go after the market for cloud computing where it can remake itself into a twenty-first century tech company. Dell already has substantial assets in non-hardware related areas. For example, it owns Boomi, a cloud integration product that enables Dell’s service group to bring together multiple cloud systems into a single solution for its mid-range customers. It partners with Salesforce.com in delivering Sales Cloud and Service Cloud solutions using Boomi and third party apps. It ties the deals together with financing from Dell Finance. So the company has some significant assets it can use to innovate new products and I expect we will see a lot of that. Lastly, as I look at this I see a similar story in Sun Microsystems which Oracle bought a couple of years ago when the once high-flying computer maker began to stumble. In concert with Oracle’s database gurus, the hardware division has rolled out some impressive next generation devices that will certainly drive cloud computing to new heights. But there’s no reason to concede that market to Oracle/Sun and Dell might have something to say about high performance cloud computing infrastructure as it begins to innovate anew as a private company. 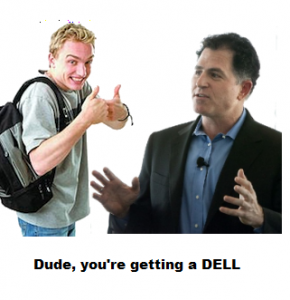 Dell’s announcement this morning is studded with opportunity and peril. But the fact that it has taken control of its destiny and that founder Michael Dell is still at the helm means that the company should now attempt to kick its innovation into high gear. The outcome is uncertain but if successful it may present a new model for what aging and once successful companies can do when the market shifts beneath their feet. This will be fun to watch.